Portuguesa is one of our Llanos states. Portuguesa, obviously, literally means Portuguese (woman) and the first location in that region to get the name was the Portuguesa River. Legend tells us that river was named after a Portuguese lady drowned there during the Conquista. From history we know some of the first Europeans in the area were indeed Portuguese coming with the Spanish flow of conquistadores and settlers. Before them the very first Europeans to see the place were the German Welser and their Spanish soldiers, who ventured into this area around 1530...and were very sorry to do so. It is a tough terrain with tropical diseases galore and the troops died like flies. The region is an extremely hot area, flooded during the rainy season and sun-baked in the dry months. There were few native Americans here compared to other regions like the coast or the Andes. The ones living here were mostly Guamos and some other groups, mostly hunter-gatherers: the Llanos back then not being the best place for agriculture. The Southernmost municipalities there are Papelón and Guanarito. Both municipios together make up about 33000 of the 17 million voters Venezuela had back in 2010. The combined area is around the size of Norfolk but with less than a tenth of Norfolk's population - the density is 6 and 11 pop/km2 for each municipality. This area is Llanos 100%: flat as it goes, with a lot of rivers - the Portuguesa being the one with the strongest flow. All rivers flow towards the Orinoco, one way or the other. Most of the land is owned by the State or by a few landowners. A lot of small farmers live in state land with no property rights - sort of feudal style but with the right to move. In the last parliament elections in 2010, candidates for the Chávez party got around 64.76% against 31.54% for the MUD in the first municipality and 63.88% to 32.89% in the second one. 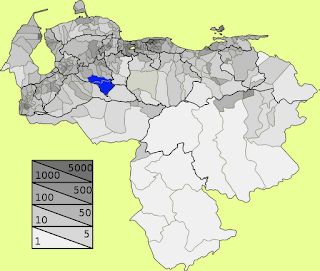 Portuguesa in general in one of the most pro-Chávez states of Venezuela. You won't find people there reading national newspapers but Últimas Noticias. Internet coverage is well below the 39% that is supposed to be the national penetration. Very few in Southern Portuguesa have access to radio or cable TV, so they won't hear any criticism on their radios or TV sets. In the 2008 elections the candidate to the post of mayor for the MUD did not even get second or third place in Papelón, just fourth, with 3.9% of the votes. In Guanarito the candidate for the Chávez party won with 65.75% and the opposition didn't do as badly, just very bad, even if in this case it was split between different candidates. The old parties that used to dominate the area there, AD and COPEI, are represented by dinosaurs and new parties such as PJ and UNT haven't got a presence there. The national representatives of those parties hadn't learnt how to send customized messages to such regions. They still don't understand those regions need to hear about their specific projects for Guanarito, for Papelón, not for "Venezuela". This is curious: the new opposition parties are very keen on decentralisation but they haven't spent the time to customize their messages for each region. To do that they need knowledge about those regions. Right now they send a central message, one that is way too abstract for those regions. This April the major of Guanarito, Villalba, was jailed for corruption. Some people in the region said the PSUV got very nervous with the level of corruption there but Villalba is just small fish. Almost no one elsewhere in Venezuela knows about this.